As promised here is the paste extruder working with Polyfilla wall-crack filler paste. As with the silicone yesterday, the flow rate is still a little high (next: try a smaller diameter nozzle), but it works smoothly. The principle of the device is proved. Now what needs to be done is to improve the design: it's a bit difficult to refill, and that needs to be made better. Also, at its heart, is a turned brass part that I think can be replaced by a rapid prototyped one. The nozzle is a slightly modified version of the one on the polymer extruder, but there is no reason for the two not to be identical. 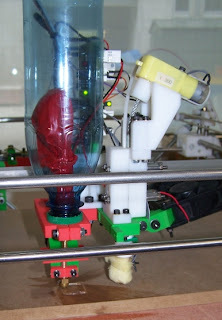 We're going to O'Reilly OSCON in Portland, Oregon to do a presentation on the RepRap. I'll be there with Suz, rubbing shoulders with the likes of Mark Shuttleworth and Eben Mogen, presenting "Fabricating a Free World" on the Thursday. Hope to see some of you there! 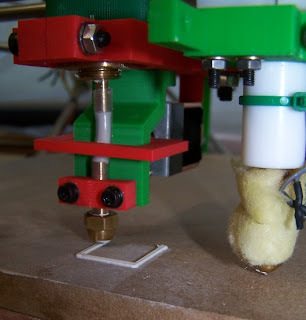 I have got the paste extruder working on RepRap. It consists of a 500 ml fizzy drink bottle containing a balloon that in turn contains the paste. You pressurize the bottle using a bicycle pump, and the flow is controlled by a latching solenoid that clamps onto a soft silicone tube on the way to the nozzle. The clamp is the red rectangular piece hovering over the tube in the picture below (the solenoid is behind the green support). When the red bit moves backwards the flow is shut off. Here is a close-up of it laying down a test square. The material is PolyDiMethylSiloxane (PDMS - silicone bathroom sealant). I had the flow set too high and the movement speed too slow, so it's flooding a bit. But that should be easy to fix. 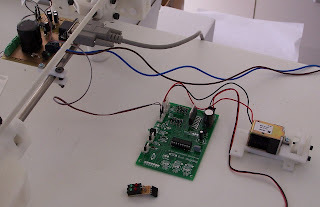 The controller electronics are really simple - just the standard RepRap controller with slightly modified firmware (which I have just posted in the software repository as extruder_1). The silicone doesn't set if you leave it in the device overnight, except for the bit actually in the silicone tube that forms the valve. I suspect that this is caused by the fact that the materials are the same, and so a little of the catalyst that caused the tube to polymerise when it was originally made is leeching out and setting the working material as well. If I am right, to fix this we just need a soft tube of another material. When the valve closes, it deposits a splodge of goo as it displaces some material. The tube I used for the valve is 3mm internal diameter, which it doesn't need to be. I'll try and find some of 1mm I.D. That should cut down the closure volume, and hence the problem, dramatically. This means that we should be able to work with just about any material that is a paste at room temperature. Tomorrow I'll use up another balloon (no expense spared) and try Polyfilla wall-crack filler paste. 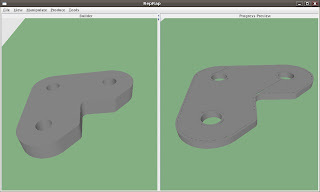 There has been a problem for some time (entirely my fault) with the RepRap simulation window (on the right above). When the machine is building it also does a virtual build in that window, adding a thin rectangular block for each line of polymer laid down. Of course, for a build of any size, the number of rectangular blocks grows very large, and Java3D has to keep them all in memory. It eventually runs out of space. But you can only see the last layer and the layer currently under construction. So I have now amended the software so that it keeps just those layers, and throws away all the ones underneath as they go out of sight. It replaces the thrown-away layers with the lower shell of the object taken from the triangles in the STL file. This shell is easy to calculate, as - when a slice is being taken for a layer of the build - the edges in the slice are precisely the lines across the STL triangles needed to make up the top edges of that lower shell. The decision we made early on to give each RepRap component its own controller on a token ring is really paying dividents: development is now made so simple*. I'm adding another extruder based on the Coke-bottle/balloon idea blogged here. It needs a timed solenoid controller - the solenoid is on the right in the picture, its controller is in the middle, and the RepRap machine is off to the left. I'll get the new device working on the bench, then bolt it into the machine. Getting it going is proving really easy* - just break out of the token ring on the Communications/Power PCB to a new controller board (supplied by the very wonderful RepRap Research Foundation), power it from the same source, copy the old extruder firmware to a new directory, give it a new address in the Makefile, and away you go. 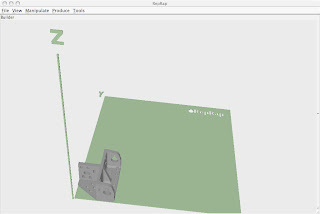 Testing couldn't be simpler* - you program a PIC, plug it into the controller, and wind up the Java RepRap control program; the extruder test function now allows you to select which extruder you want. It takes me about a minute to go through the cycle of amending the firmware, putting it in the PIC, and trying it out. *As soon as this is posted The Fates may read it, of course, and then my boasting will get its reward - easy and simple will become hard and complicated. 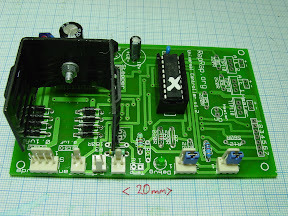 RepRap V1.2 Stepper Controller Board instructions done. 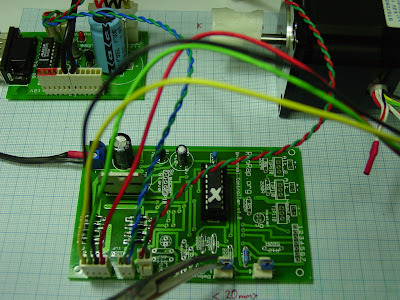 I've now done the stepper controller instructions for the V1.2 board as well. They were much easier and I could re-use a lot of Adrian and Zach's original prose. Check here for yourself. I'm part way through the extruder board instructions, so cut me some slack on that one! I am visiting Jens Kaufmann at Heriot Watt University to give a RepRap talk to his group. 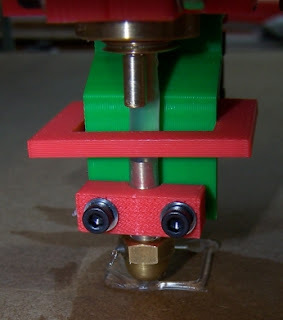 He has come up with a really neat way to make very fine nozzles for RepRap. Stick a standard nozzle with an 0.5mm hole on the end of a piece of silicone tube. Then flow copper sulphate solution through it and connect it up to copper-plate itself from a lump of Cu in the top bath (see the pic). The copper will plate on the inside of the hole closing it up. The thing has beautiful negative feedback, in that - if an area starts to close up too fast - the plating rate drops just at that location. For best results it needs a constant-current source so you get a precise plating rate. You stuff the silicone tube right into the nozzle to prevent the threads being plated too.